When it comes to electric locks used in an access control systems, there are many types to choose from, and it's important to ensure you get the right one for the job! 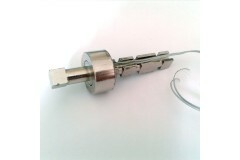 The most common and 'solve-all' sort of approach is to fit an electro-magnetic lock (commonly called a mag-lock). This is basically a large electromagnet and a corresponding armature plate which secures the door in place when it closes. 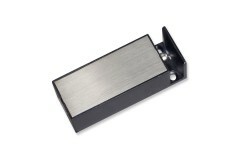 Maglocks are simple to install and are very attack resistant. The way the work with an access control system, is that when a valid code or card is used on your access control reader, the system will cut the power to the maglock, releasing its magnetism to allow the door to be opened. They can also be used with a push to exit button on the inside to achieve the same result without having to use valid credentials on a reader to exit. Another common solution is to use an electric strike release. These can be simple to install when they are designed for drop-in replacement of a standard strike, and again work in conjunction with a proximity reader or keypad, or a push to release button, where the system receives the message of a valid pin, card, fob or button press, and then triggers the electric strike release to allow the door to be opened. 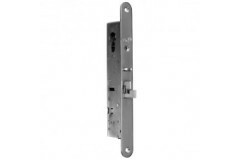 Unlike maglocks which require power to lock, electric door releases are available in fail-safe and fail-secure options depending on your requirements. So you can have them draw power to lock just like a maglock does, or you can get them to be locked as default, requiring power to unlock. But what is becoming more and more popular now as we all become more security-conscious with our access control systems, are the electric motorised multipoint locks. These are just like the multi-point locking solutions we have seen on uPVC doors for years, but now are being fitted on wooden and composite doors too, which has revolutionised the electric locking industry, and whilst the more traditional electric locking solutions still work for many, electric multipoint locks should be strongly considered these days. And should be your only real consideration if you've got a plastic uPVC door which requires actual security. With all the different locking solutions, it is important to consider the type of set up you require in the event of a power failure or emergency situation such as a fire alarm activation. Does the door need to be freely opened to allow escape? Or is it not part of the escape route and required to remain locked? For further advice on the most appropriate option for your door, please get in touch and discuss your requirements with our Access Control Specialist, Darrel. 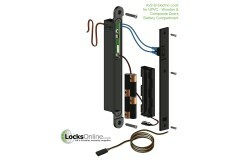 You will also notice we now offer a range of electric door operators. These look just like overhead door closers we've all seen in commercial buildings for years, but these are powered versions which will physically open and close the door with a motor to aid disability assistance and similar. We have these electronic door operators for single doors and double doors, as well as commercial safety kits to suit them. Need help with Electronic Locking? Electronic Locking comes in so many forms & brands, it can be confusing. What do you need? An Electric Door Release? A Magnetic Door Lock? 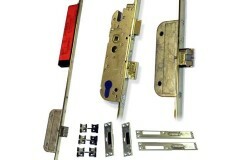 Or perhaps you're looking for UPVC Electronic Locking? If you're not sure, don't panic! Our head of tech Darrel Walters (as seen on the right), has specialised in the industry for 30 years & is here to assist you. Electronic Door Openers make opening and closing your doors easy! Having the option to automatically open and close your doors can be both highly convenient and in some cases essential for building ac..
For years fitting keypads, proximity, biometrics and intercom systems to work in conjunction with upvc doors has been incredibly difficult. Not any more! We are pleased to offer a range of electricall..
With the influx of composite doors over recent years, we know that fitting access control on composite doors has become somewhat of a necessity for many homes and businesses. As such, many manufacture..
Electric door release replaces a standard strike mounted on the door frame and receives the latch and latch bolt. 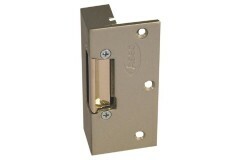 They can be used with Nightlatches, Dead locks, Latches and Sash locks. With an electr.. 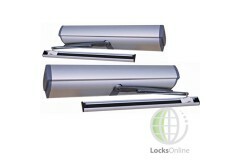 Magnetic Door Locks are commonly called a mag lock. A large electromagnet is mounted on the door frame and a corresponding armature is mounted on the door, which then holds the door closed until relea..
Solenoid Bolts provide electrical locking of a door by driving bolt into the strike preventing the door from opening. They are a comparatively simple means of locking a door electronically, and provid..
Electric locks are suitable for a number of applications such as fitting on metal doors and gates. You can update to electric security with ease whether this is for the convenience of having an electr.. 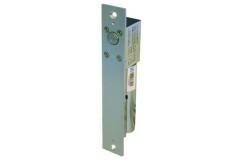 These electronically operated bolt locks are designed for cabinets and cupboard doors, where you nee.. 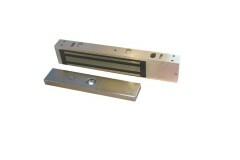 This electrically operated spindle is a fantastic new idea, allowing you to have door entry control ..